The focus of much of the research that examines the food system coming from the planning and policy fields is empirical and reductionist, following a rational technocratic planning epistemology. One critical failing in this approach is a general reliance on the state and its close ties to capital through a global neoliberal economic philosophy that is entirely enmeshed with the food system. This research thus examines methodological approaches to identifying and measuring food deserts, "obesegenic" environments, and the like, and proposes solutions that tinker with the current system, such as the inclusion of grocery stores in food deserts. Such a research approach will not lead to a radical transformation of the food system. Those who seek a fundamentally different food system based on democratic and ecological principles need to look elsewhere for solutions. Fortunately, examples to study are everywhere once one knows what to look for. 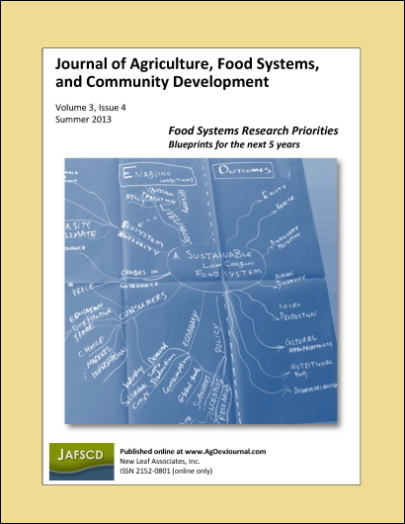 Following the theoretical work of Deleuze and Guattari, Virno, Graeber, and Holland, a five-year research design would begin to identify, understand, and determine how to assist and connect examples of community-based programs that collectively represent an exodus from the current food system. Such a program would need to recognize reformist ideas and research agendas while clearly delineating an alternative long-term strategy based in a distinctly oppositional, nonstate, radically democratic approach to building a new food system. Associate Professor, Department of Urban Design and Planning, University of Washington; 3949 15th Avenue NE, Room 410; Seattle, Washington 98195 USA; +1-907-786-6541.